Compared to most of the people of history, the Vikings acted rather strangely. They were almost absurdly brave, willing to risk everything for adventure and glory; they restlessly sailed all the seas and rivers within their reach, voyaging far beyond anywhere profit might take them; they set up grand memorial stones for those who died on mad foreign adventures but erected no monuments for those who stayed home. Historians think that underlying this behavior was a particular socio-political system. The dominant political figures were kings and jarls, great men who owned halls and ships and lands. These aristocrats surrounded themselves with warriors who ate in the halls, crewed the ships, and fought their lords' battles. 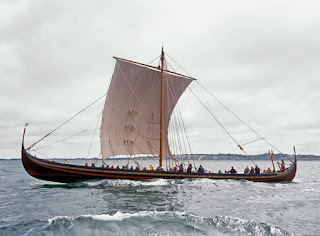 According to the sagas, some of these warriors were young men who stood eventually to inherit lands of their own, but many were landless younger sons or outsiders from other parts of the Viking realm. Among these warriors the competition for status was intense, and they vied with their companions in bravery and feats of arms, hoping to win the lord's favor and thus to obtain wealth and lands for themselves. 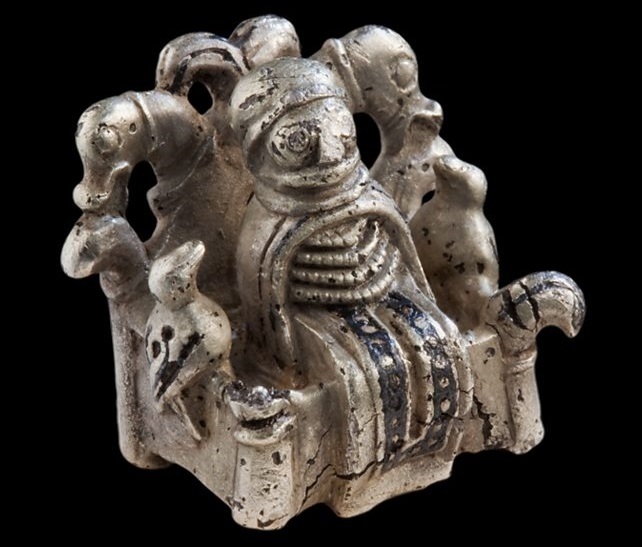 Viking women, meanwhile, were notably powerful and outspoken and seem to have been picky maters; many Viking stories revolve around men competing for the favor of noble women, perhaps partly because the doweries they commanded would allow their husbands to advance from landless warrior to landed nobleman. Underlying this competition seems to have been a shortage of land, not in any absolute sense but in the social sense that only a few people could obtain the resources necessary to become or remain members of the elite. So far as we can tell, this system was not particularly ancient. 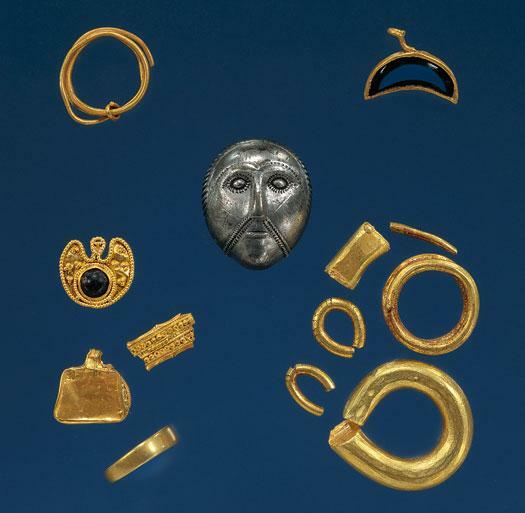 The society of Bronze Age Scandinavia does not seem to have been dominated by prominent lords, since there are no fortresses or notable concentrations of wealth. The religious life seems to have been dispersed through the countryside, and certain holy bogs and groves were more important than temples. The most common religious artifacts were sun symbols, reflecting the old neolithic agricultural rites. 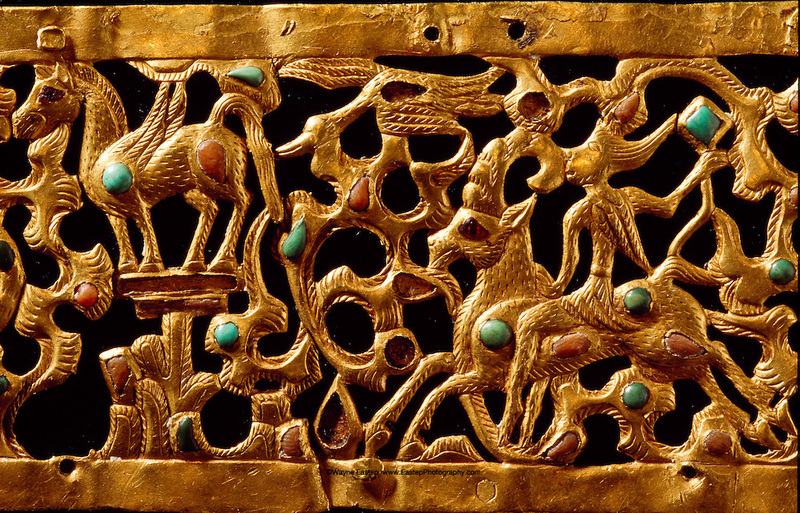 Over the past thirty years Scandinavian archaeologists have devoted a lot of attention to how and when the institutions that underlay the Viking world took shape. 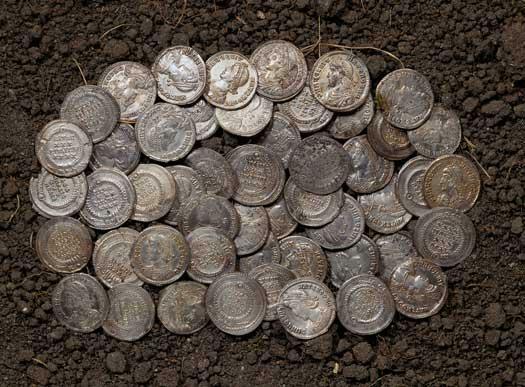 They have zeroed in on the period of the late Roman Empire, 250-450 AD. It is in this period that we see the first settlements that look like royal seats, with treasure troves and comparatively grand buildings. 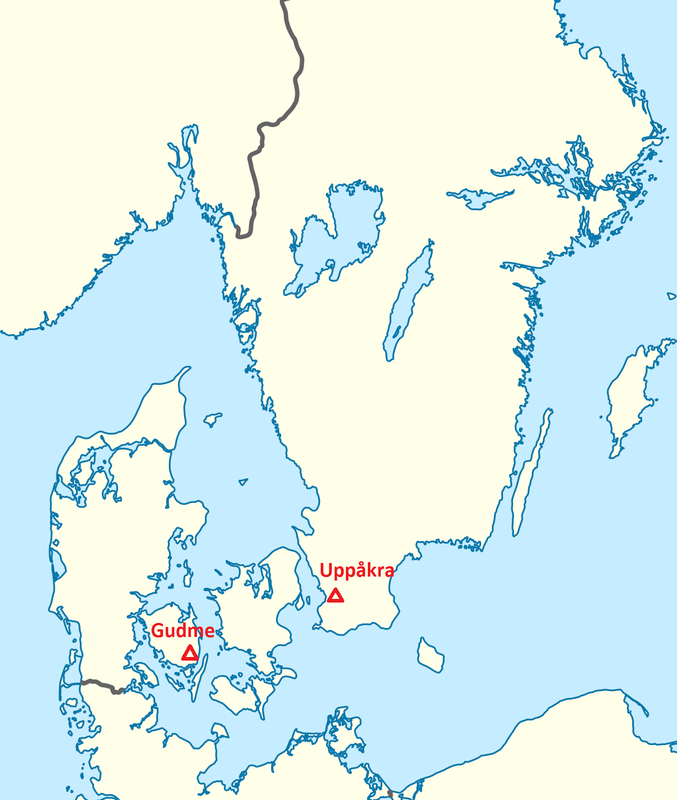 The two best known such sites are Gudme in Denmark and Uppåkra in Sweden. 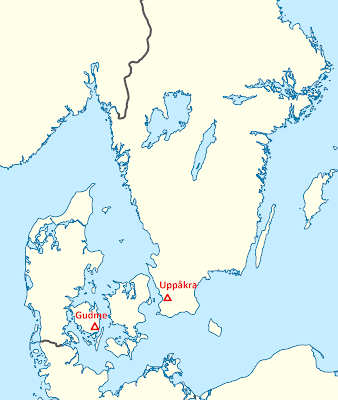 Gudme was occupied from around 250 to 650 AD. 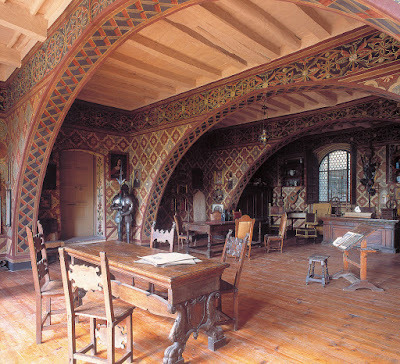 It consisted of a magnate's residence surrounded by a sort of dispersed town of fifty smaller farms, likely home to around 500 people in all. The name, which goes back to Medieval times, seems to mean "home of the gods." 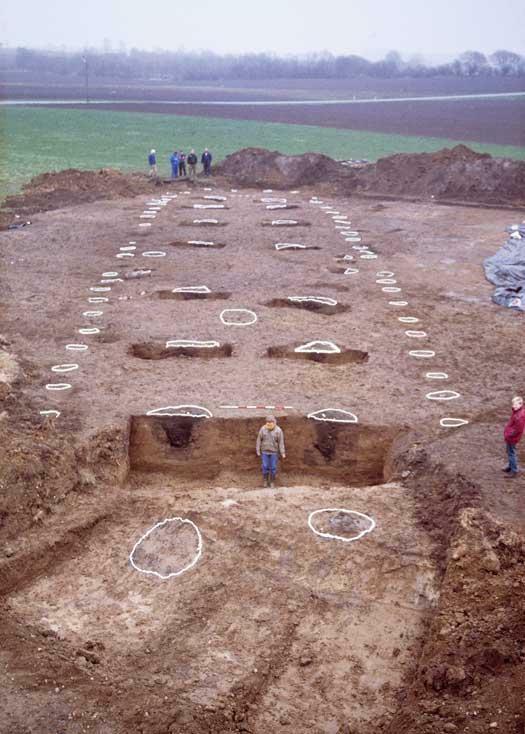 In the 1990s archaeologists uncovered the grand hall that was at the center of the site, 47 m long and 10 m wide (155 x 33 feet). Look closely at this image and you can see that the post molds (the dark stains left by the decayed posts) are bigger around than the person standing next to them; the roof of this hall was held up by large trees. 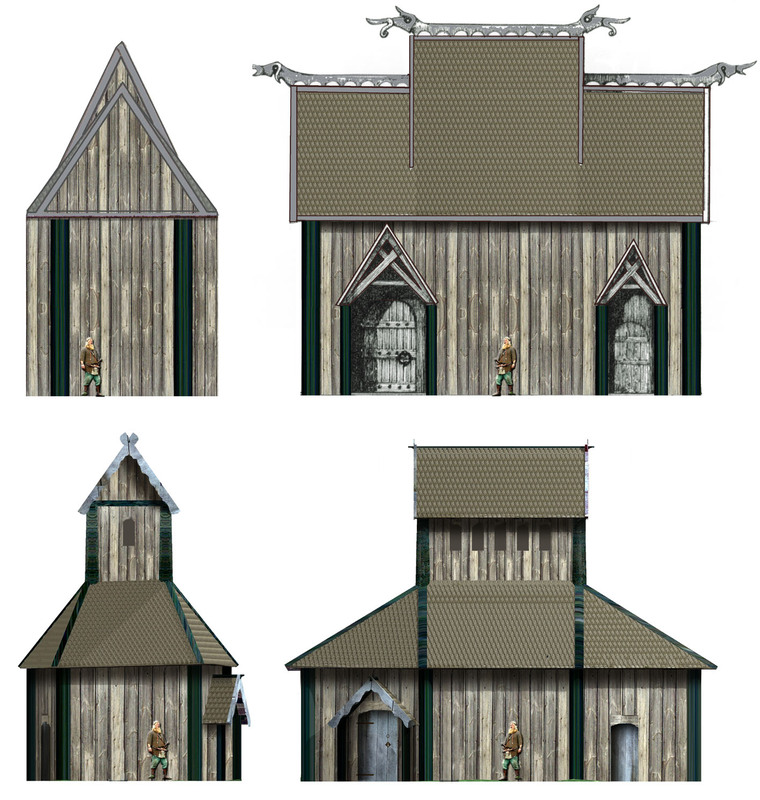 The posts were not evenly spaced but arranged so as to create a single large room in the center, no doubt where the lord lounged on his High Seat to receive his followers and hear bards extol the deeds of his ancestors. Nearby was another exceptional building, smaller but equally well built, that was probably a temple. Those were the only two buildings in the center of the site; all the barns, sheds, and so on were relegated to the surrounding farms. much of the rest, like these gold pieces, seems to have been made in imitation of Roman forms. 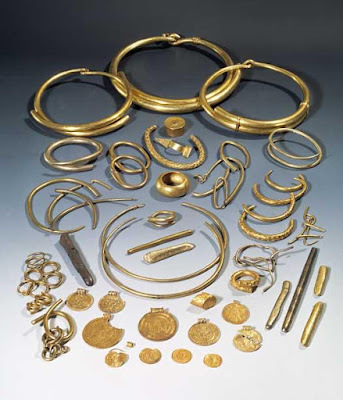 A great deal of gold- and silver-smithing was done at Gudme, along (most likely) with other luxury crafts. Adjacent to one of the posts of the temple building was this votive deposit, probably buried as a sacrifice when the building was erected. A hoard plowed up nearby in 1833. The site is very impressive, and the argument that was the home of a king or jarl on the medieval model is strong. It seems notable that the site had such strong connections to Rome. 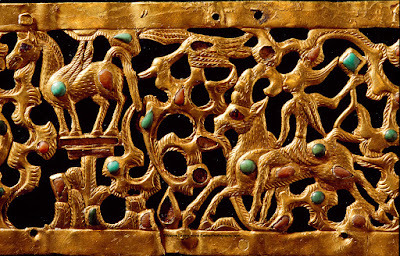 Roman influence certainly played a part in the rise of Scandinavian kings, although how direct and important that influence was are disputed. Some think the Romans pretty much created these kings by singling out certain chieftains for favor and gifts, while others think that certain local lords enhanced their status by cornering a big part of the trade in luxury goods with the south. 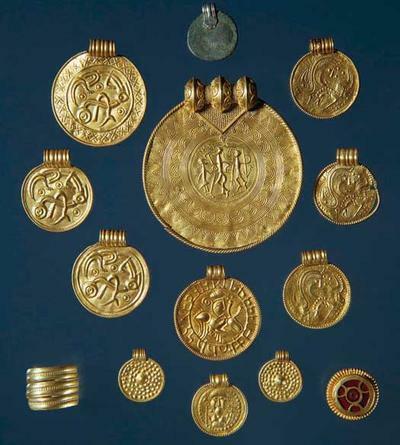 Uppåkra in southern Sweden is a much older site, going back to the Bronze Age. Around 450 AD it also became the seat of a king or jarl. A mighty hall was built, more than 40 meters (130 feet) long, and it was surrounded by dozens of other structures. 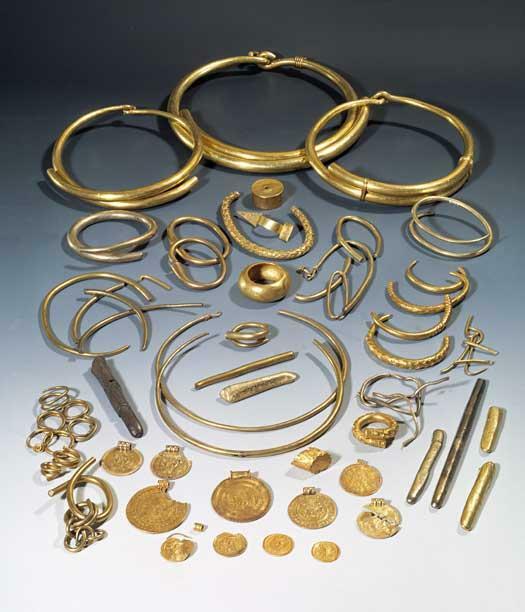 Intensive metal detecting around the site has let to the discovery of more than 30,000 objects of gold, silver, and bronze. 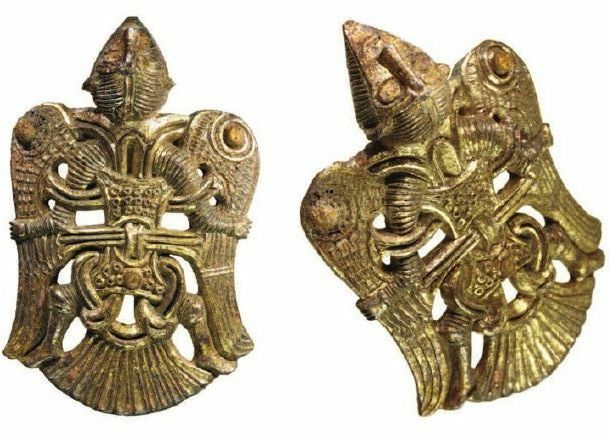 The most famous is this gold amulet of a man wearings wings, said to be Weland (or Volund in Swedish) the Smith in his suit of feathers. 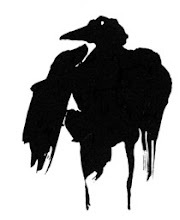 I could tell you what I think of the suits of feathers one finds in several old European stories, but for that you'll have to wait for my novel. 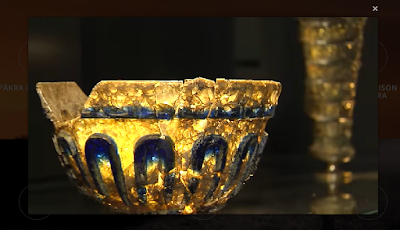 Less Roman material has been found at Uppåkra than at Gudme, but there have been several notable discoveries, such as this glass. The most famous thing about the site is another building that stood near the hall. As you can see in the simplified plan above, the building consisted of an outer wall that sat in a trench and four massive inner posts that were very carefully supported on stones as if to hold up great weight. 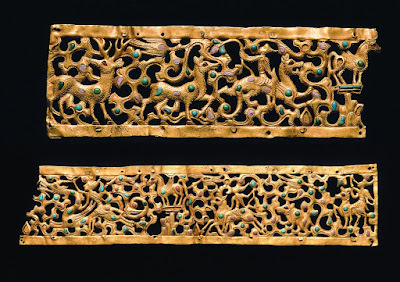 Most archaeologists think the point of those posts was to hold up a taller central section, the same technique used in some medieval stave churches. 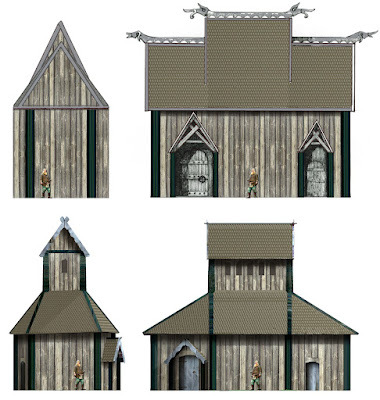 Above are two different reconstructions. The building obviously had great ritual significance; more than 200 of these small gold foils (called in Swedish "gullgubber") were buried in the foundation ditches and around the central pillars. These temples were one of the key attributes of Viking Age royal seats; control of the temples (and later of churches) was one of the main sources of their wealth and prestige. 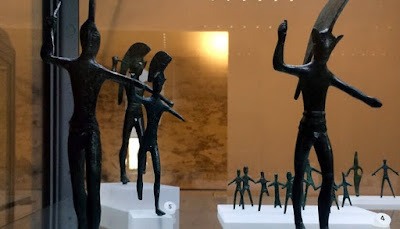 As I said, temples do not seem to have been very important in the Bronze or early Iron Ages, so here is a clear sign that medieval kingship was forming. 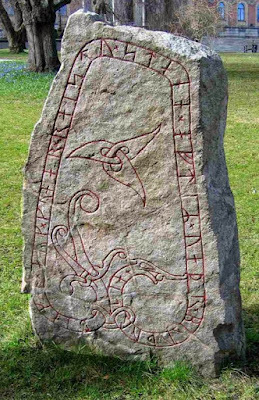 As these jarls and kings gathered more of Scandinavia's wealth and power to themselves, they created an ever-intensifying, increasingly violent competition for status and resources that, when coupled to the new technology of the longship, eventually drove the great raiding and trading expeditions of the Viking Age. There was also an ideological side to this military expansion, expressed through the cult of the death god Odin and the implacable fates, but that will have to wait for another post. John Richards' "Battle of Fredericksburg"
John Richards was a private in the Union Army and one of the very few ordinary soldiers from the Civil War to memorialize his experiences in paint. This remarkable painting was part of the collection of Nelson and Happy Rockefeller, and it is scheduled to be sold at Sotheby's on January 18. Here is Richards, done up in his veteran's regalia, I imagine for some reunion event. Richards was born in 1833 in Switzerland and emigrated to the US in 1854. 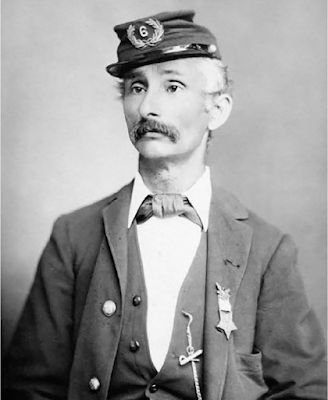 He became a citizen and when war broke out in 1861 he enlisted in the 59th New York Volunteer Infantry. 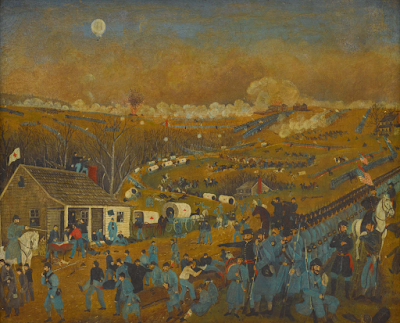 The 59th fought at Antietam, where Richards was wounded. It was while recuperating from that wound at a hospital in Philadelphia that Richards began to draw. The 59th next came under heavy fire at Gettysburg, where they had a part in stopping Confederate attacks on both the second and third days. 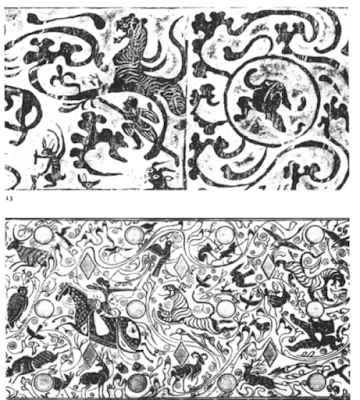 After the war Richards settled in Germantown, and his only publication was a book of etchings of Germantown's older buildings. So far as we know Richards did only sketches during the War, so this oil painting must have been made afterward. 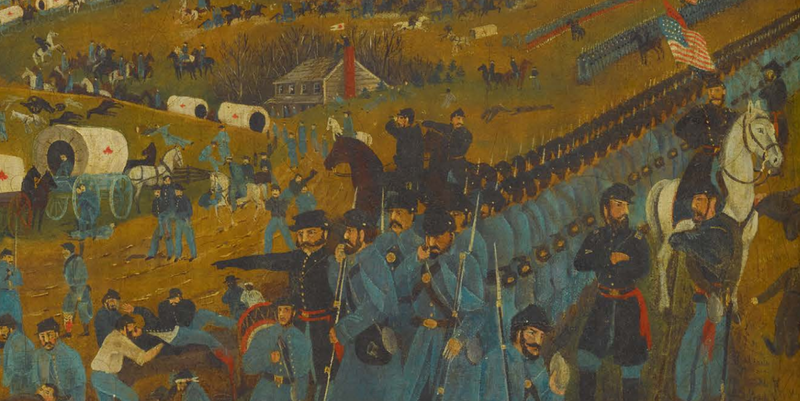 The Battle of Fredericksburg was a dismal affair, showing how incompetence of a hundred kinds stymied the Union war effort in the east. General Burnside, then in command, had the clever idea to slip away from Lee's army, which was guarding the Rappahannock River upstream where it was fordable, march rapidly to Fredericksburg and cross the deep river on Pontoon bridges, seizing the high ground on the south bank before Lee's army could react. 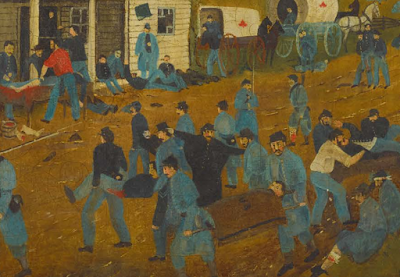 But due to some military snafu the pontoons did not arrive until a week later than scheduled, so the army could not cross until the Confederates had all made the trip themselves and taken positions on those formidable heights. Burnside then compounded the error by attacking anyway, despite the awful terrain, which led to the deaths of more than a thousand of his men. But it might have gone differently if not for yet another twist of fate. Burnside assigned the attack to two subordinates. 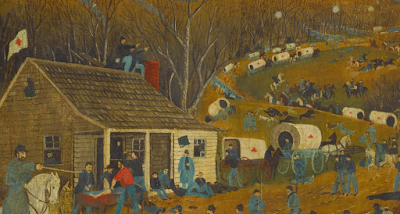 One of them drew the assignment to assault a massive bluff known as Marye's heights, and he threw charge after charge at its unshakable defenders until the fields were covered with corpses. The other, facing less formidable terrain, made a very tentative advance that blundered into a gap in the Confederate line that might have been blown wide open by a vigorous attack, but this leader chose to quickly cut his losses and pull back. Switch the commanders and things might have gone very differently. But of course they did not, and Lee famously exulted, "It is well that war is so terrible or we should become too fond of it." 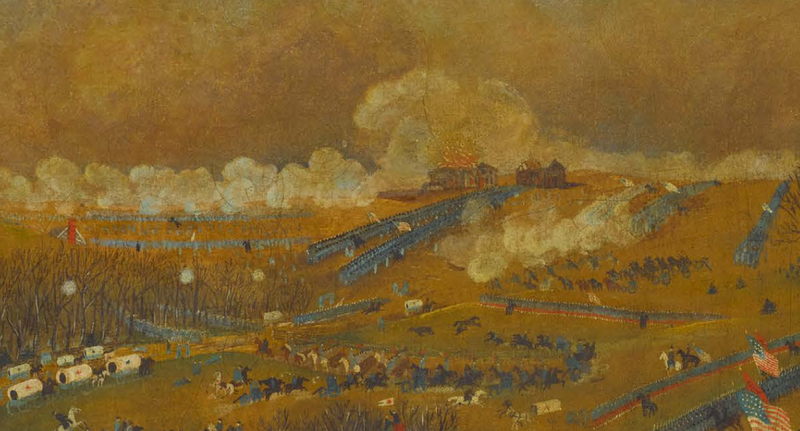 Richards and the 59th New York avoided the carnage this time; they were positioned "in support," as you can probably tell from the distant view in this painting. It is certainly not a great painting, and there was a real artist (Alfred Waud) as close to the fighting as Richards ever got, and he left some fine sketches. But Richards was a private who had been shot at Antietam and would take his stand on Cemetery Ridge at Gettysburg. He was a real soldier, and this is a soldier's view of war. The Rockefellers were big collectors of American folk art, so it is easy to see why they bought and loved this painting. The Kargaly Diadem is a magnificent golden artifact from a nomad tomb in the Tian Shan region of Kazakhstan. 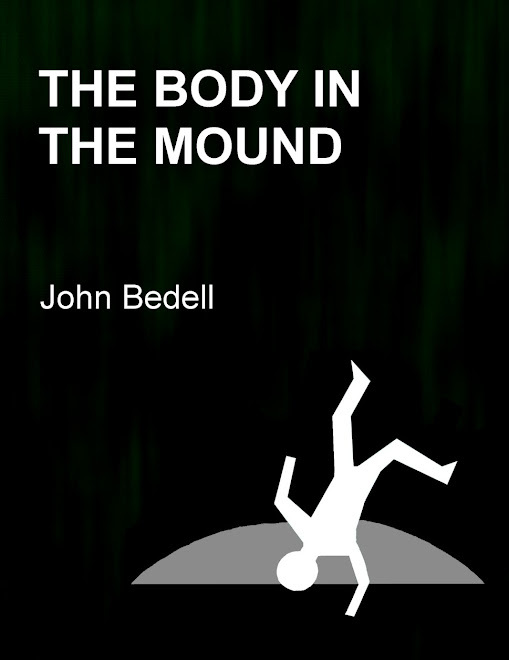 In 1939 it was "found by chance in a heavily disturbed burial in a crevice in the Kargaly valley." 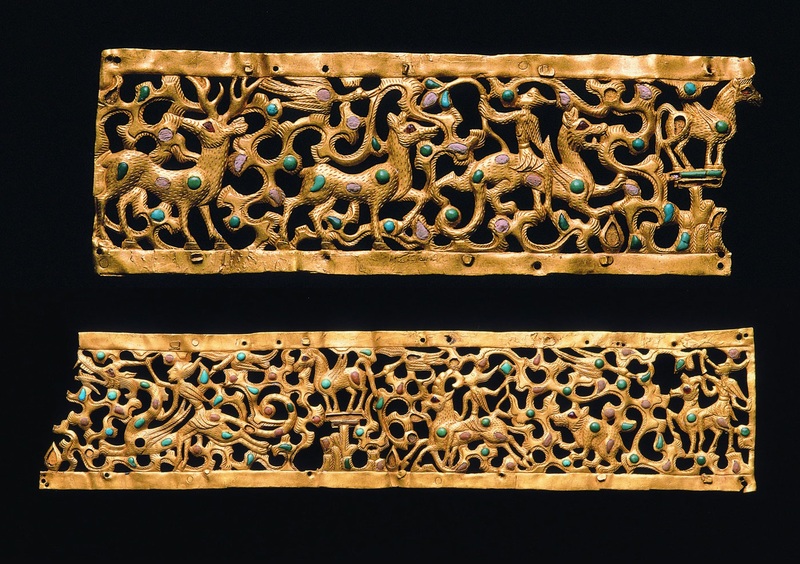 In 2012 it was part of "Nomads and Networks," a traveling exhibit of objects from Kazakh museums that toured the US and Europe. Oddly the museums hosting that exhibit did not feature it among the highlights you can see online, and the Times also ignored it. 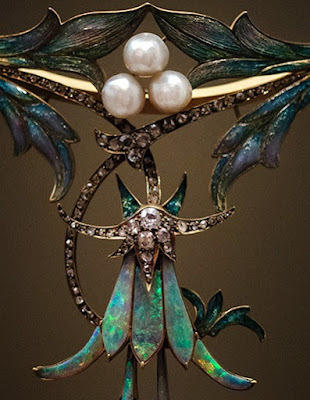 I discovered it last month while perusing a Tumblr of random beautiful objects. 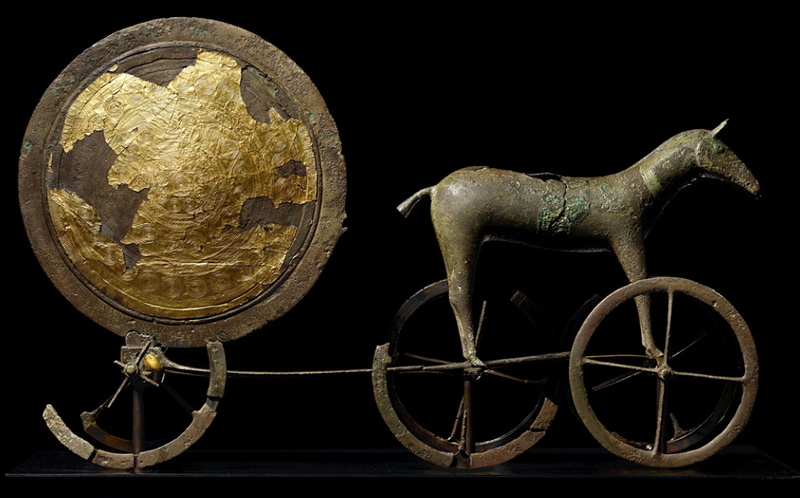 It dates to between 200 BCE and 100 CE. What got me about this diadem is this figure. What is that? It looks like a sprite from one of the Victorian fairy books. 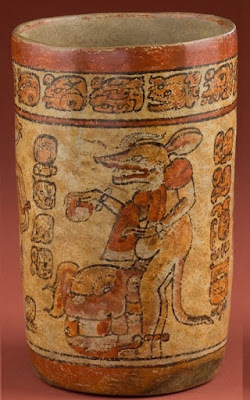 And riding a dragon? Did that action ever appear in art before 1880? 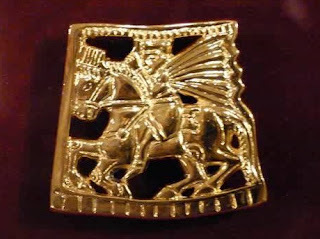 And there are more such figures on the diadem. Who are these mysterious beings riding deer and goats through this fantastic forest? I searched around online but all I could find were a couple of references to the catalog for the Nomads and Networks exhibition. Not seeing any alternative, I ordered a copy, and it came today. 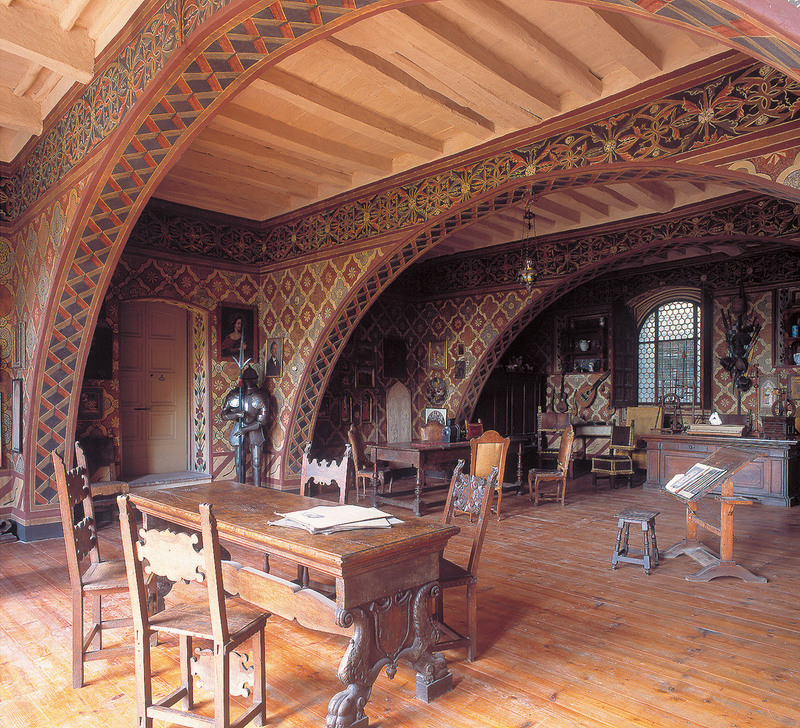 It is magnificent and full of strange lore. The catalog calls the sprites "winged furry creatures," and it suggests that they resemble Yuren, "winged people", from the art of Han China. 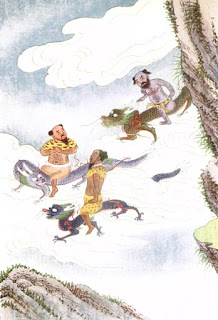 The Yuren were one species of Xian, "Immortals," beings who populate heaven. This sent me scurrying around the web looking for sources on the Yuren. 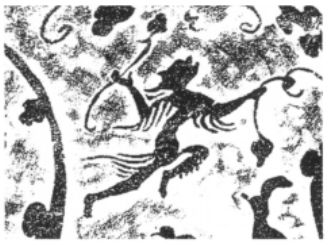 I eventually found just what I was looking for, a 2011 article by Leslie Wallace titled "Betwixt and Between: Depictions of Immortals (Xian) in Eastern Han Tomb Reliefs," which you can find on JStor. 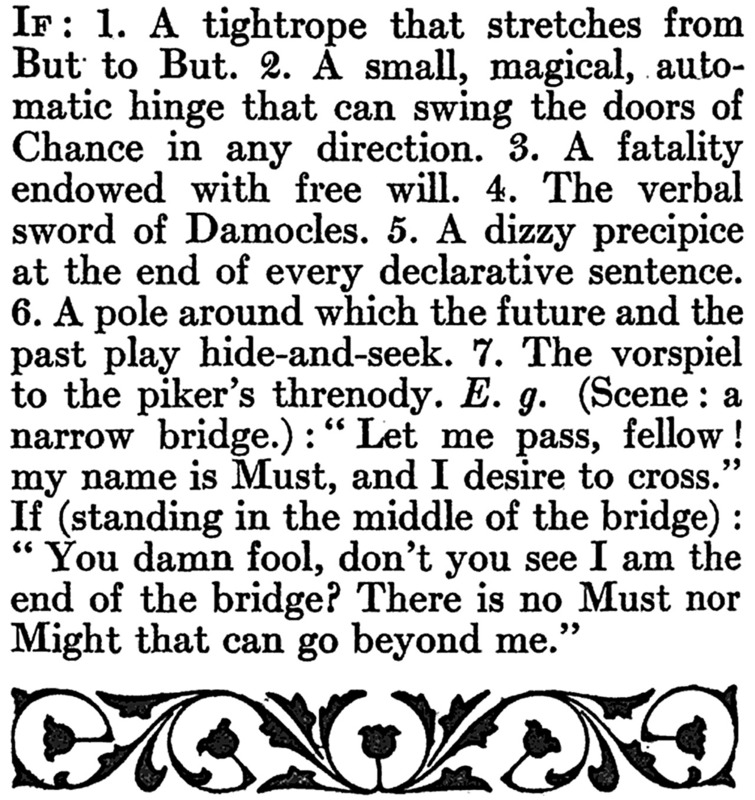 Sadly the illustrations are these low-resolution black and white things, but the text is marvelous. 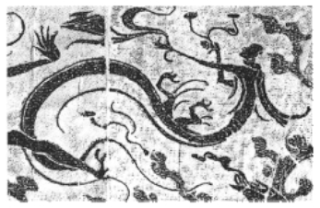 Immortals (xian 仙) are depicted as feathered sprite-like or dragon- or snake-tailed figures climbing stylized mountains or floating in swirling cloudscapes on tomb reliefs from the Eastern Han dynasty (25–220 CE). These images represent immortals as transient figures moving through an intermediate realm where they are often joined by deer, tigers, dragons, birds, heavenly horses (tianma 天馬), and other animals. 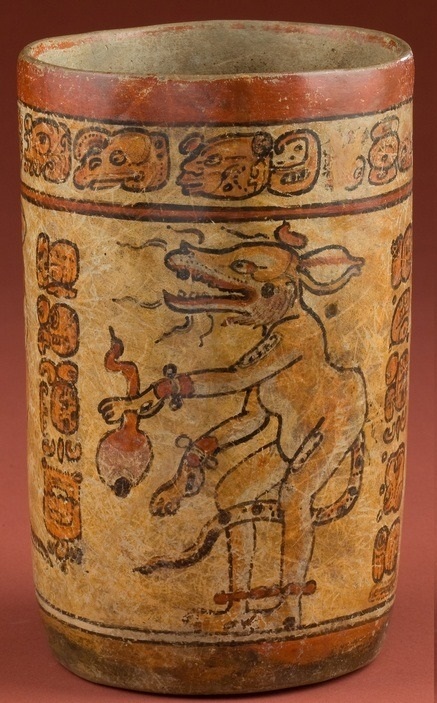 analyzes the physical hybridity of immortals, their transitory existence, and their role as shaman-like intermediaries, demonstrating that Eastern Han representations of immortals repeatedly emphasize their liminal nature and close connection to the animal world. Their position betwixt and between physical forms and realms of existence was the basis of their spiritual power, enabling them to assist the deceased in their transcendent journey to paradise. There is a Han encyclopedia called Shanhaijing, "Classics of Mountains and Seas", which seems to be the Chinese version of Pliny the Elder. 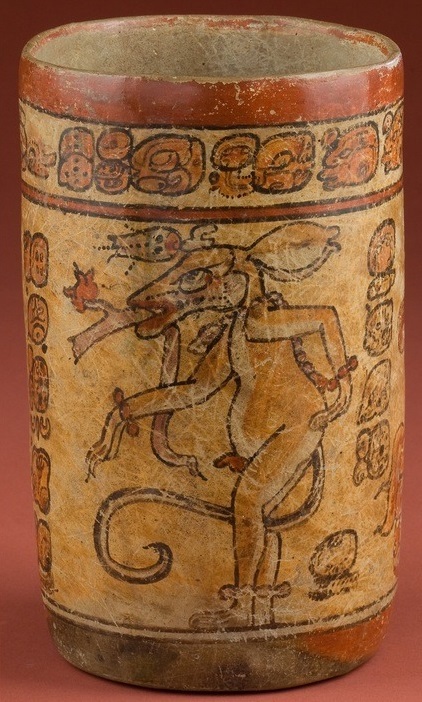 It describes several classes of hybrid beings, including the Yuimin or "feathered people." The earliest textual source describing immortals as winged creatures is found in Yuan Yu, "The Far-Off Journey," a poem from the famous Chuci or "Songs of the South", a compendium first written down around 100 BCE. And swiftly prepared to start on my journey. In the evening I dried myself on the shores of heaven. The early Daoist immortals were much like ancient shamans. 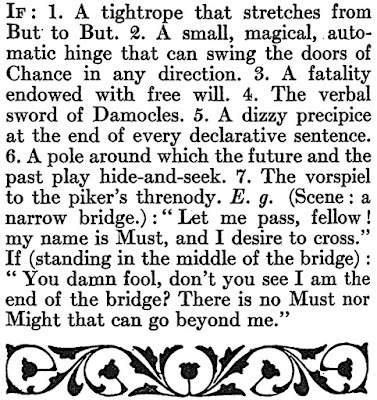 (Modern illustration above.) 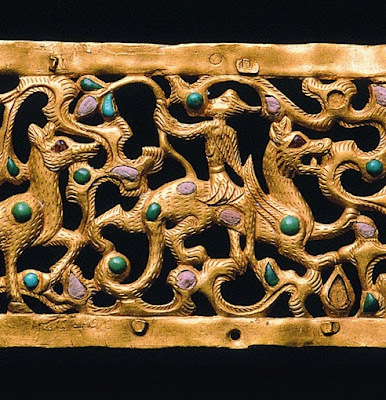 They flew through the air, often mounted on animals like these dragons; they journeyed to heaven and the land of the dead; their travels were often fueled by sacred mushrooms. On their journeys they met many strange peoples, including the Yuren, whose prominence in tomb art suggests that they inhabited the borderlands of death through which all souls passed. 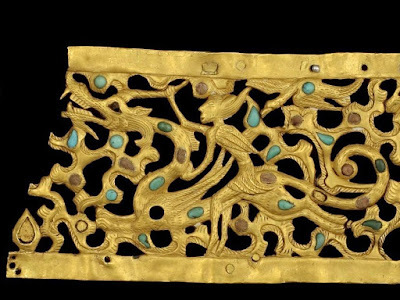 So from this mountain tomb comes a remarkable object indeed, a golden crown woven with spirit beings from the mystic realms where shamans wandered. Its inspiration is Chinese, but it may actually have been made on the Steppes, which means that Wusun artisans shared this lore with the Chinese. Perhaps they had a different interpretation of these beings from the Shamanistic netherworld, but then again perhaps their new queen explained it all to them. Was she a priestess herself, a wanderer in those lands? Surely whoever wore this diadem engaged in rites related to those shadow realms even if she did not journey there herself. 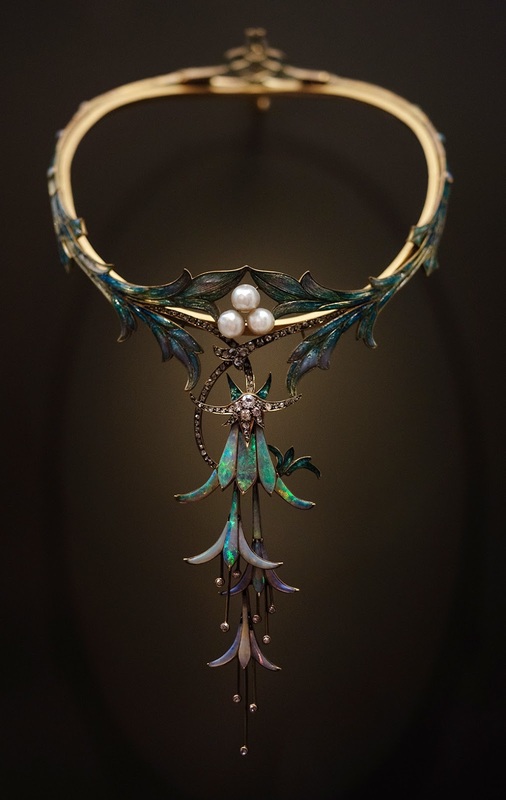 But it is more fun to imagine the queen or her daughters donning this crown as they inhaled the sacred smoke or chewed the sacred mushrooms, preparing for the long journey into the twilight lands in search of wisdom, or to guide lost souls toward their final homes. Toward the end of his second term, President Obama and his closest advisers took to calling the foreign policy establishment/military industrial complex "the Blob." They were deeply frustrated that the "experts" refused to offer them any options to meaningfully reduce US involvement in foreign wars. Hence Obama's great satisfaction the one time he stood up to the Blobsters, refusing to order attacks after Assad crossed his "red line" in Syria. And now Trump, it seems, shares his predecessor's frustrations. I of course think that withdrawing US troops from Syria and Afghanistan is a great idea. I do understand that it is better to work with one's generals in arranging these things rather than just announcing them over twitter, but sources are telling the Times that Trump tried to get the military to give him withdrawal timetables and they simply refused. Some former Trump advisers attributed the sudden nature of the announcement to Mr. Trump’s frustration with generals who resisted him at every turn when he tried to set a timetable for getting out of Syria and Afghanistan — something, his supporters point out, that he had promised to do during the 2016 campaign. So there's one thing for Trump; he thinks that the President should set our military policy, not a lot of generals and ambassadors, and is willing to act on his convictions in a way that a more cautious and mainstream leader probably would not. Another great piece that received one of David Brooks' Sidney Awards: The Great Chinese Art Heist by Alex Palmer. For about a century, from 1840-1949, foreigners stole antiquities from China on a regular basis, or else bought them at fire sale prices from people and institutions ruined by the chaos of those years. 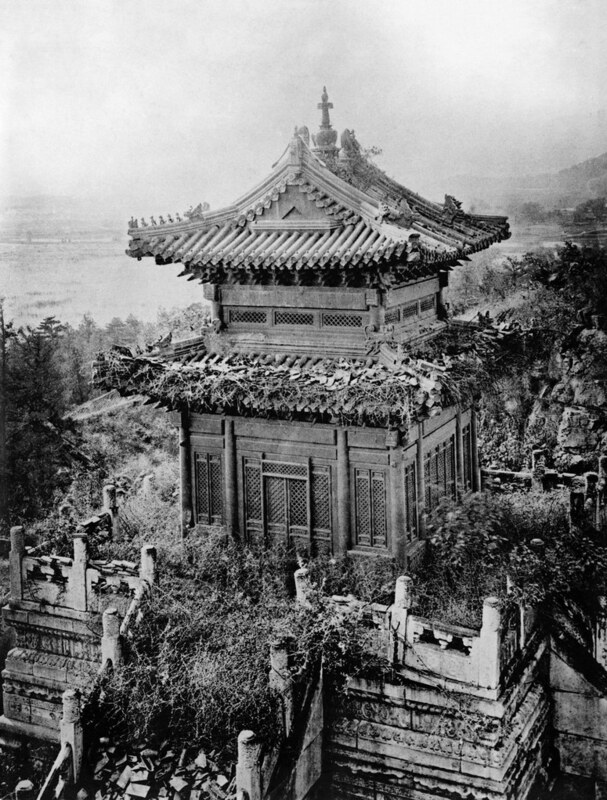 The most famous theft took place in 1860, when French and British troops waging the Second Opium War (which was about as noble as it sounds) spent three days looting the Imperial Summer Palace outside Beijing. These thefts have long rankled Chinese nationalists, and now that China has more billionaires than the US some of them are buying back looted art whenever it appears for sale. The spree began in Stockholm in 2010, with cars burning in the streets on a foggy summer evening. The fires had been lit as a distraction, a ploy to lure the attention of the police. As the vehicles blazed, a band of thieves raced toward the Swedish royal residence and smashed their way into the Chinese Pavilion on the grounds of Drottningholm Palace. There they grabbed what they wanted from the permanent state collection of art and antiquities. Police told the press the thieves had fled by moped to a nearby lake, ditched their bikes into the water, and escaped by speedboat. The heist took less than six minutes. 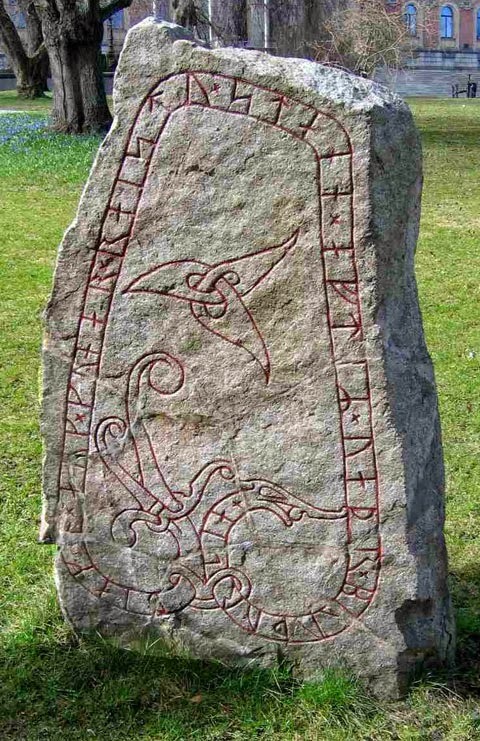 Like others who have looked into these thefts, Palmer thinks this could not be happening without at least the tacit support of the Chinese government; when officials from a Norwegian museum spotted an object stolen from them on display in the Shanghai airport, the official response to their complaint was "prove it." 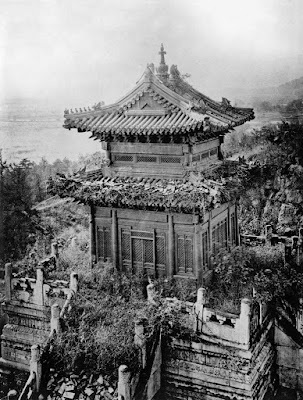 There is a sense, of course, in which the Chinese are right; the looting of the Summer Palace was a crime on a far grander scale than Lord Elgin spiriting away some marbles from Athens. If the Chinese government were filing claims for these objects at the International Court of Justice I would support them. But stealing them back carries the danger that the main result will be the encouragement of lawlessness on the part of everyone who feels aggrieved, which I think is a real threat to civilization. The more the Internet exposes people to new points of view, the angrier people get that different views exist. David Brooks has posted his Sidney Awards for long-form journalism, an event I always look forward to at this time of year. One of his winners is a piece in The New York Review of Books by Mark Lilla, one of my favorite journalists, on the French New Right. These are the same people Thomas Chatterton wrote about in The New Yorker a year ago, which I wrote about in January. I find these people and their program fascinating, and I recommend Lilla's piece. In countries as diverse as France, Poland, Hungary, Austria, Germany, and Italy, efforts are underway to develop a coherent ideology that would mobilize Europeans angry about immigration, economic dislocation, the European Union, and social liberalization, and then use that ideology to govern. Now is the time to start paying attention to the ideas of what seems to be an evolving right-wing Popular Front. This past summer I spent some time reading and meeting these young writers in Paris and discovered more of an ecosystem than a cohesive, disciplined movement. Still, it was striking how serious they are and how they differ from American conservatives. They share two convictions: that a robust conservatism is the only coherent alternative to what they call the neoliberal cosmopolitanism of our time, and that resources for such a conservatism can be found on both sides of the traditional left–right divide. More surprising still, they are all fans of Bernie Sanders. the relationship between religious and political identification is reversing in Europe—that it is no longer religious affiliation that helps determine one’s political views, but one’s political views that help determine whether one self-identifies as religious. The new rightists long for a more organic alternative to the global society of international neoliberalism, with its worship of the free individual. 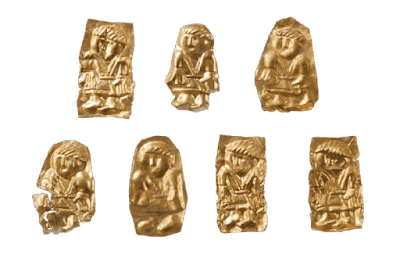 They are strongly environmentalist and often expound on the need to produce and consume less so that our human and natural heritages can be preserved. Above all they talk and write lovingly of European Civilization, and they argue that it is the mission of a nation to pass on its accumulated wisdom to future generations, "not to serve an agglomeration of autonomous individuals bearing rights." I see this error of the left all around me, the refusal to take those who disagree with them seriously. The new right is a very powerful force, and it cannot be dismissed by saying that it is "just racism" or "just another way to defend the interests of the powerful." 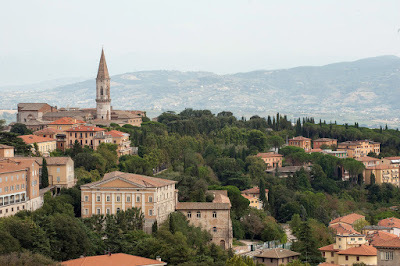 Perugia is the old capital of Umbria, a hilly part of central Italy between Tuscany and Rome. Today it is a thriving place with 160,000 inhabitants and has spread well beyond its ancient, walled core; but within that core are wonders. Panoramic photo of the central square, worth clicking on. The town is ancient. When Rome was rising it was one of the cities of the Tuscan League, and it appears several times in Livy's narrative of Rome's early wars. 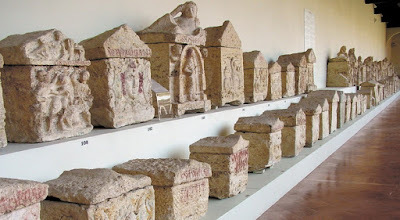 Today its archaeological museum contains many wonderful artifacts from Etruscan times. 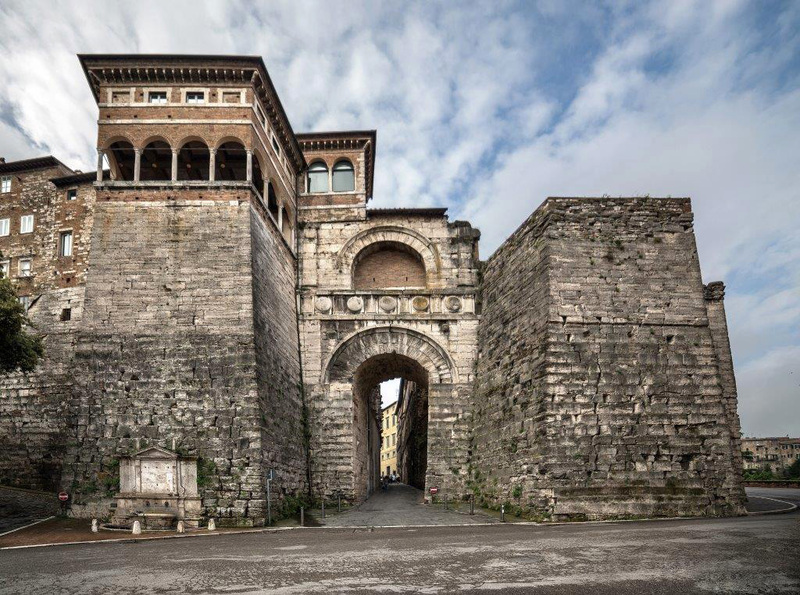 The only architectural remnant of pre-Roman times is this gate in the city wall, which has been modified but still retains Etruscan elements. The city was caught up in the Civil Wars at the end of the Roman Republic, and in 40-41 BC Octravian besieged it and took it, burning everything except the temples of Juno and Minerva. 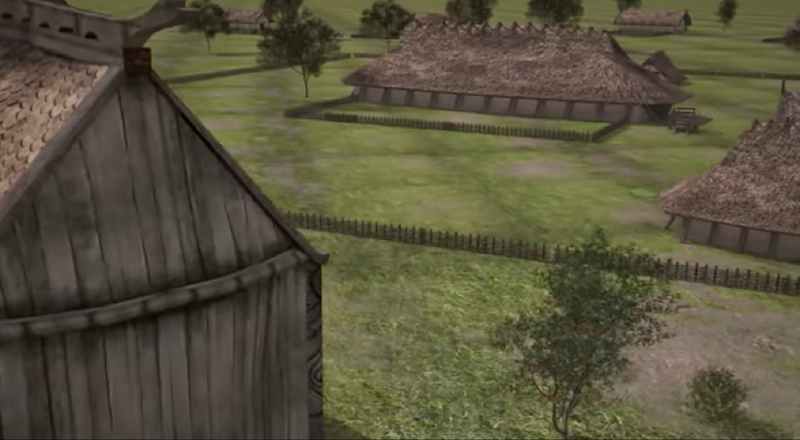 Octavian then ordered all the inhabitants to leave and gave the town lots to whoever wanted them, along with the farms within a mile of the walls. We hear little of the city until 547 AD, during the wars between Justinian the the Goths, when it stood with the Gothic leader Totila and was besieged and sacked again. In the ninth century Charlemagne granted it to the pope. But these are just shadows; the city's real history begins in the 13th century, when the leaders of its commune began fighting with the popes and others for their independence. It was the usual Italian story, with Guelphs vs Ghibellines in a savage struggle for power and prestige. 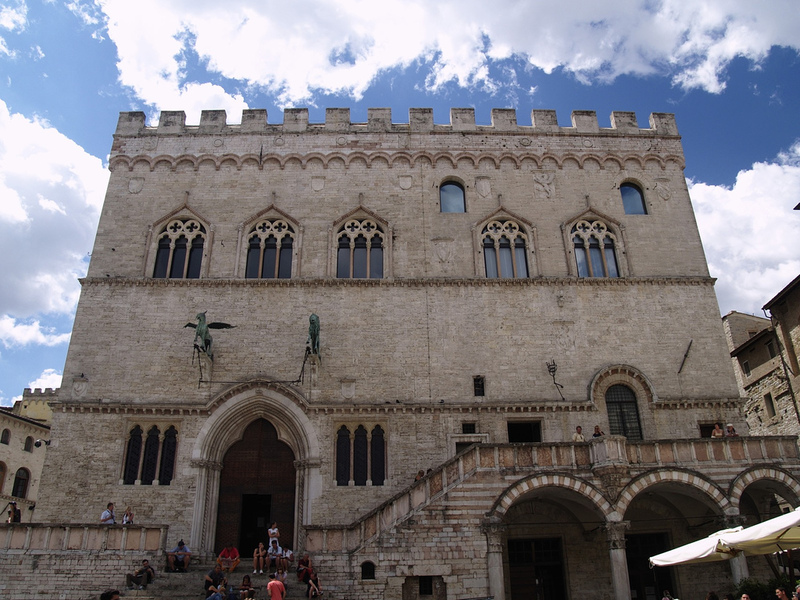 Above, the Palace of the Priors, that is the town hall, dating to the early 1300s. 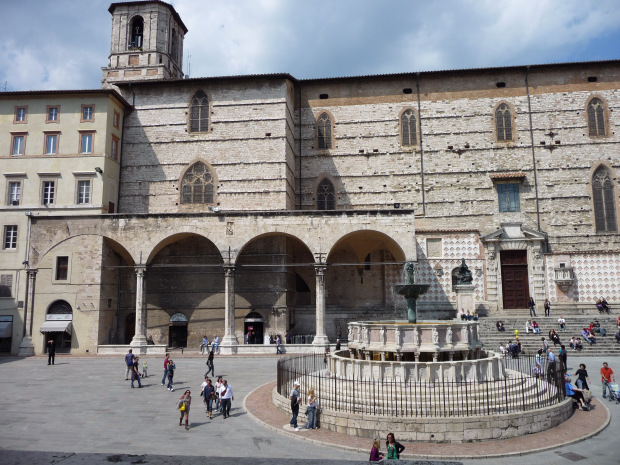 The town's main focus these days is its university, founded in 1308, which counts 11 popes among its alumni. Several American universities send students there, so if you search for the university online most of the first dozen links are for such programs. 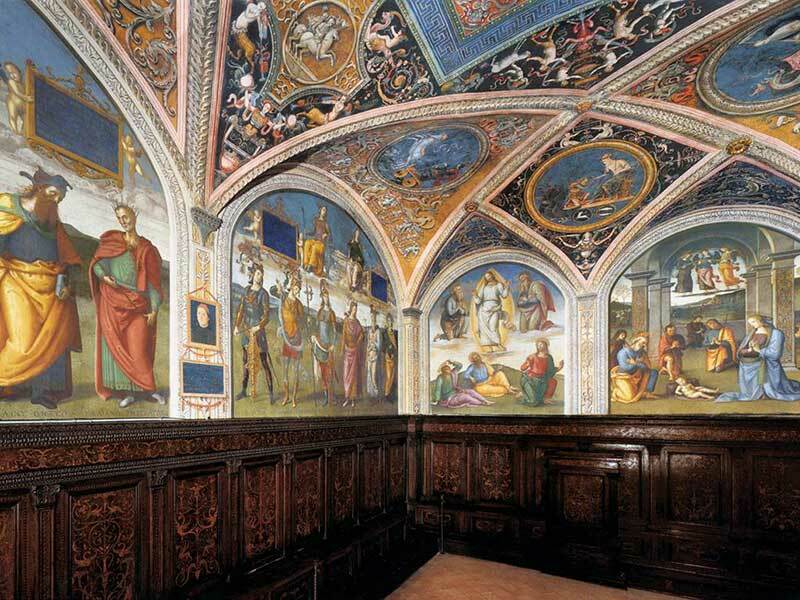 Frescoes in one of the old college buildings. 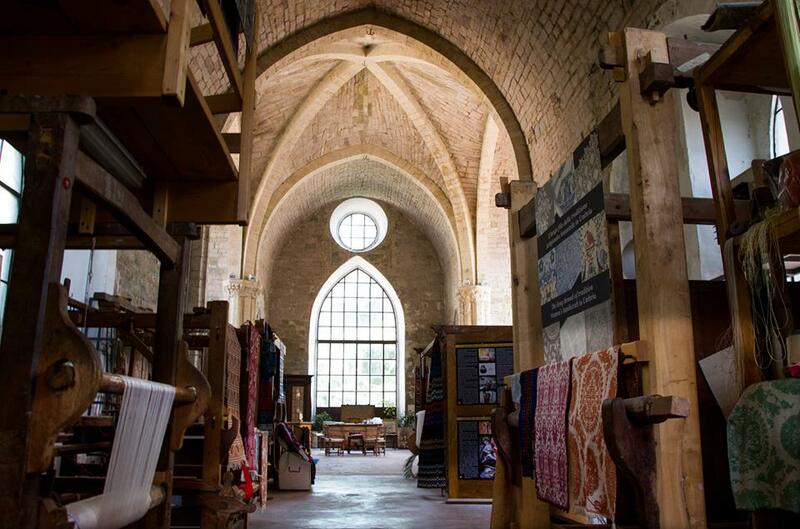 Among the town's most notable businesses is the "Giuditta Brozzetti" textile workshop, where traditional Umbrian fabrics are recreated on 19th century looms. The workshop, founded in 1925, is located in the former Chiesa di San Francesco delle Donne, the Church of Saint Francis of the Ladies. 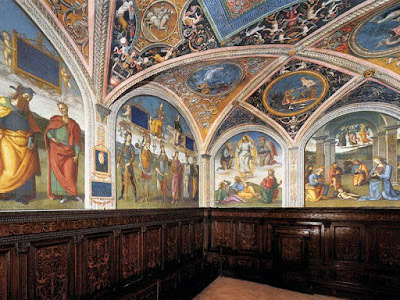 The church was a Franciscan friary on a spot where St. Francis actually preached (Assisi is not far away), but the friars were eventually replaced by Benedictine nuns, hence "of the Ladies." The church was closed down in 1810 and was for a while a school for poor girls. 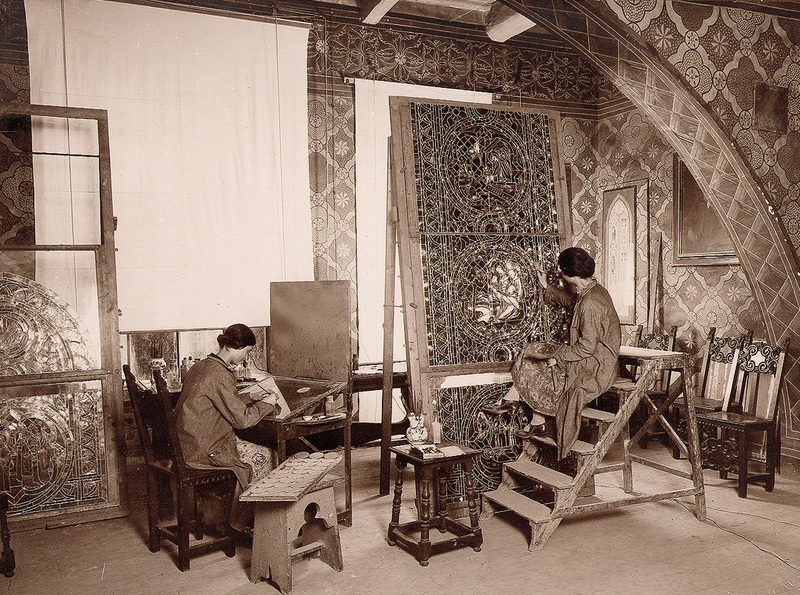 There is also a notable workshop for the manufacture and restoration of stained glass, Studio Moretti Caselli. The pictures above show the studio today and in the early 20th century. Seems like a remarkable place to spend a few winter days. Should You Go to More Parties? Walter Crane, "Flowers from Shakespeare's Garden"
Max Abrahms, "Rules for Rebels"